Made from high quality stainless steel and acrylic, the server set is safe. The the server set is delicate, helping to create a happy atmosphere. MATERIAL: The blades of the knife and shovel are made of superior stainless steel and the handles are made from acrylic, so the knife and shovel are safe and durable. DESIGN ON HANDLE: The twined fibre line on the handle helps to prevent sliding. The net and flower make the handle delicate. DIMENSION: The blade of the knife is 8.16 inch * 1 inch, and the blade of the shovel is 5.6 inch * 2 inch. The handles of the knife and shovel are 5.2 inch. The design of dimension is reasonable to make it comfortable to hold the knife and shovel. DELICATE PACKAGE: Each server set is packed in a delicate topped box with a gray and white silk design base. SUITABLE FOR DIFFERENT OCCASIONS: The server set is suitable for different occasions such as marriage ceremony, birthday party, festival and other celebration ceremony. 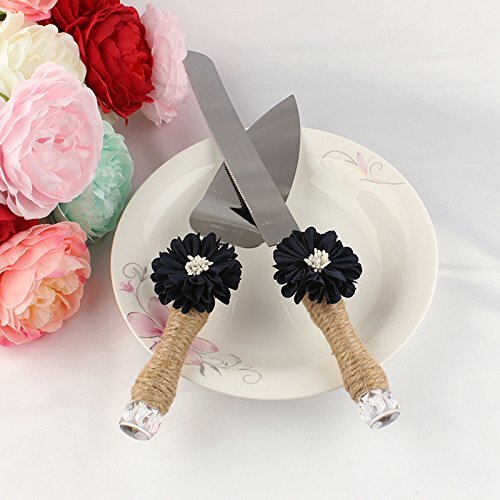 Leaf Shape Cake Cutting Knife Cake Cutter Knife.